The developers of Miro have released a first release candidate of the upcoming Miro 5 version. 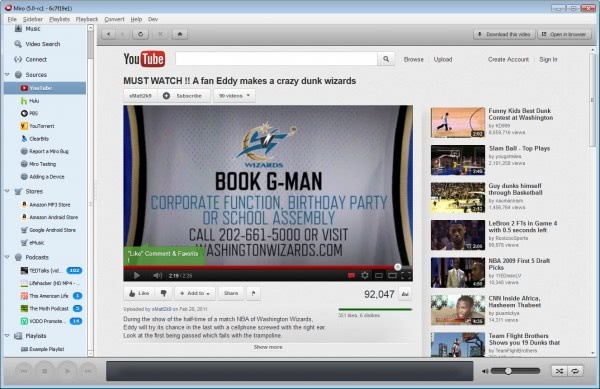 Miro at its core is a media player with Internet connectivity built right into the software. The software can play back media formats and supports the playing and downloading of media from the Internet. You can use it to manage your local video and audio library, go to video hosting sites like YouTube from within the program interface to watch and download videos from there, subscribe to podcasts, download torrent files, or make use of the channels and shows offered by Miro. Channels include the ever popular Ted Talks, Buzz out Loud or the Discovery Channel Video podcast. You can subscribe to these channels to receive updates when new items are published. A lot has changed since our initial review in 2008 and last year’s update to Miro 4. The developers behind Miro have now released the first release candidate of the upcoming version 5. This is a test version which is not suited yet for productive environments. While the majority of features work without larger issues, you will come upon a few bugs in that version, like the inability to minimize the program version using the button at the top of the window. When you look at the program interface you will notice that it looks more or less identical to previous versions. The developers claim massive updates to the Windows backend of the software. The new version of Miro now supports downloading HD videos from Vimeo feeds, faster device syncing and format conversions, song information and album art lookup, and a new album view mode that groups together songs by album and artist. Interested users can download the release candidate of Miro 5 from the official blog. Downloads are provided for Windows and Mac Os X, and the source code. New users should check out the Get Started section for an overview of some of the things that Miro allows them to do. Are you using an all-in-one media player like Miro, or do you prefer to keep things separate? I commenti sono disabilitati per questo articolo. LG G Flex: in arrivo a Novembre il primo smartphone con schermo curvo? © Copyright 2004 - 2013 Web Burning - Part.IVA 00587600453. All Right reserved.